The six English stop sounds—/b/, /p/, /d/, /t/, /k/, /g/—initially appear simple, but quickly reveal intricate details as learners become more familiar with their characteristics. At the beginning of the stop sounds, the tongue or lips briefly block the air from leaving the vocal tract. The release of the air from this 'stopped' position is called aspiration. Stop sounds occur in voiced/unvoiced pairs. The six English stop sounds—'b sound' /b/, 'p sound' /p/, 'd sound' /d/, 't sound' /t/, 'k sound' /k/, and 'g sound' /g/—initially appear simple, but quickly reveal intricate details as learners become more familiar with their characteristics. At the beginning of the sound, the tongue or lips briefly block the air from leaving the vocal tract. The release of the air from this 'stopped' position is called aspiration. Stop sounds occur in voiced/unvoiced pairs. Of the six stop sounds in English, three are voiced (meaning that the vocal cords vibrate while producing the sound) and four are unvoiced (meaning that the vocal cords do not vibrate while producing sound). Voiced and unvoiced sounds often occur in pairs of sounds with similar vocal tract shape, with the major difference between the pairs being the use of the vocal cords or not. While the question of the involvement of the vocal cords is the greater difference between voiced and unvoiced sounds, the amount of aspiration plays a secondary role in articulating each sound. In general, the aspiration is greater in unvoiced sounds than voiced sounds. This characteristic is complicated by the fact that, additionally, the aspiration is greater at the beginning of words and the beginning of stressed syllables than in other locations within words. Compare the aspiration of the following stop sounds at the beginning of words. There is more of a puff of air during the aspiration of unvoiced stops. The vowel sound before voiced consonant sounds has a longer duration than the vowel sound before unvoiced counterparts. 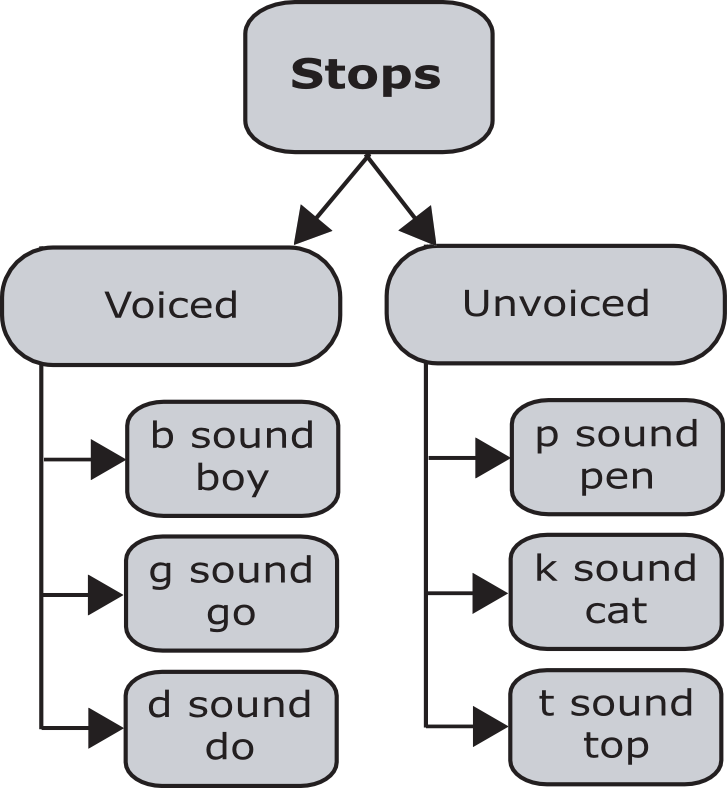 Since a stop sound at the end of a word has little aspiration, the change in vowel duration subtly helps listeners of English determine which stop sound was spoken. Some dictionaries will use a colon-like symbol of stacked triangles /ː/ to note a vowel with increased duration.